Honestly, I have been looking forward to this wedding since last year. 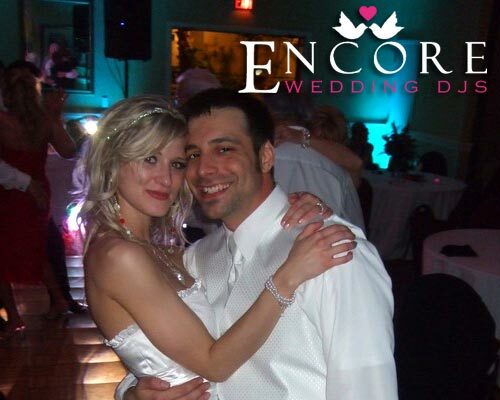 Dan and Krystal celebrated their wedding reception @ Embassy Suites Hotel in Livonia Michigan. Dan wanted to light his entire room, we met with him @ the facility to give them an exact quote on the lighting. Since they had their ceremony in the atrium we provided the music with our Going to the Chapel package. It was such a gorgeous day, I wish they would of had their wedding outside. When it comes to weddings, there is one thing that you can always predict… that they are unpredictable. There was a problem when we arrived @ 3:30 to setup the lighting+reception+ceremony, the room was being occupied?! We could not setup! I was told by the facility 1 month before their wedding that we could enter the room @ 4pm. It takes us roughly 2 hours to setup lighting+reception+ceremony. It turned out the meeting in the room (that we should have been setting up in) was not leaving until 5pm! We had to work our butts off to get everything up in time. It was super stressful, but hey that’s why you hire us. We do all the stressing for you! The lighting looked AMAZING when it was all said and done. What was really cool, was how we ending the night. I asked for everyone to circle Dan and Krystal for a nice send off as we played the last song for the evening. They picked Lionel Richie All Night Long, and it was the perfect touch to the end of the reception. You can view their satisfaction survey at the following link. Have a great time in Vegas, and thanks for choosing us as your entertainment solution!